Volkswagen Group CEO Herbert Diess talks with reporters after meeting with President Donald Trump at the White House, Dec. 4, 2018, in Washington. Volkswagen's chief executive said on Tuesday after a meeting at the White House that the German automaker was building an alliance with Ford Motor Co and might use the U.S. automaker's plants to build cars. 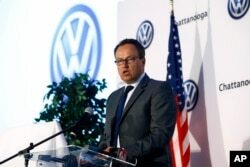 VW executive Hinrich Woebcken announces that the new 5-seat Atlas SUV will be built at Volkswagen Chattanooga on Monday, March 19, 2018 in Chattanooga, Tennessee.